In medium frying pan, heat butter (over medium heat). Put topping apples in pan; sprinkle with cinnamon and sugar. Stir and cover; let this cook on medium heat for 5-10 minutes and then switch to low heat until you are ready to use them. For whipped cream: combine all ingredients and mix on high until cream is fluffy. For pancakes: Beat egg until fluffy. Add all other ingredients except chopped apple; stir until just mixed (don't overstir). Fold in apples, mix and fry on griddle or pan around 350ºF (surface will need to be greased if it's not already seasoned). 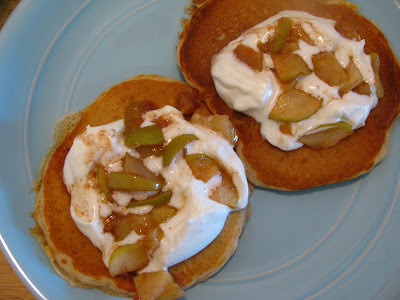 Top cooked pancakes with whipped cream and apples and enjoy! This recipe is made possible by my brother Jared, who gave us an awesome griddle for our wedding present.